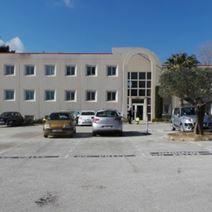 The facility features 36 fully equipped offices, with modern furnishings and high-performance telephone and computer networks. It also has a meeting room that can accommodate up to 12 people. A centralized access control and a sophisticated alarm system ensures the protection of the premises. In terms of transport, the highway Marseille-Toulon-Nice is about 1 mile away, Marseille International airport is 1.5 hour's drive and the La Seyne Sur Mer and Toulon TGV stations complete the transportation links. A small range of bright and flexible office spaces are available to let, all fully furnished and ready for occupancy. This centre stands amidst the area's industrial district and has an attractive, sunny atmosphere being close to the coast and a short way from central Toulon. Within the immediate area, there are several grocery stores providing mundane amenities, as well as a gym, two campsites, several restaurants and hotels.